Gasmet is a leading supplier of gas monitoring systems for demanding industrial and environmental applications – typical examples of which are continuous emissions monitoring and stack testing. Gasmet’s gas analyzers are reliable, user-friendly and provide consistently accurate results – all at a highly competitive price. Gasmet develops and manufactures the Gasmet’s line of gas analyzers and monitoring systems. Our goal is to provide our clients with innovative, customer-driven solutions for industrial gas measurement and monitoring applications. Gasmet’s products are reliable, user-friendly and provide consistently accurate results, all at a highly competitive price. Gasmet’s FTIR gas analyzers can perform simultaneous measurement of both organic and inorganic compounds, as well as analyze hot, wet and corrosive gas streams. Concentrations of up to 50 different compounds can be measured within seconds. Gasmet’s FTIR gas analyzers are compliant with the US EPA 40 cfr, part 60, Appendix b, Performance Specification 15. 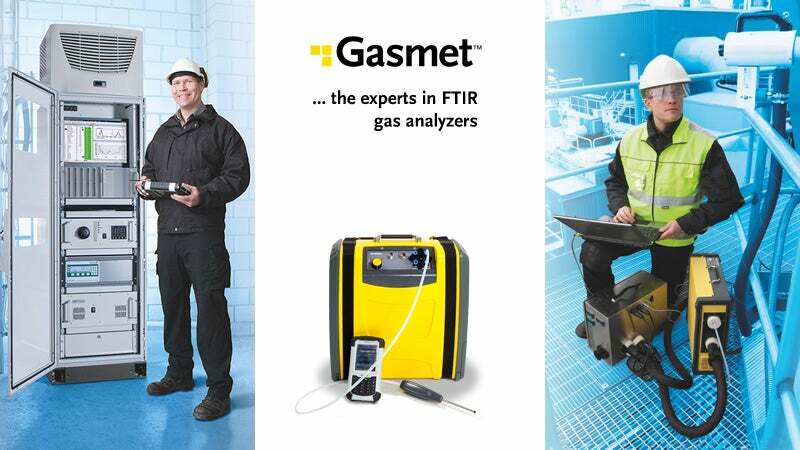 Gasmet’s DX4030 is a lightweight FTIR gas analyzer for ambient air analysis. It is designed for applications where a number of compounds need to be accurate monitored in ambient air. Examples include leakage detection and various industrial hygiene applications (monitoring of VOCs, TICs, anaesthetic gases, etc.). Thanks to its lightweight construction and fast response time, it is also well suited to first-response / HAZMAT type applications. Gasmet’s CMM provides an innovative solution for trace mercury analysis (Hg) in flue gas. It utilizes the highly advanced CVAF measurement principle. Our factory in Finland takes care of the assembly work, quality assurance and calibrations. Our supply chain network spans the globe and it consists of companies that share our vision of high-quality and state-of-the-art technology. We also have the capability to design and manufacture customized systems, for applications where standard solutions are not suitable. Gasmet’s analyzers are sold and supported through a global distributor network that covers all continents. Gasmet’s headquarters are located in Helsinki, the capital of Finland. We have two fully owned subsidiaries: Gasmet Technologies (Asia) coordinates the marketing and sales activities of Gasmet analyzers in the Asia-Pacific region and provides technical service in the region. Gasmet Technologies provides sales and after-sales support for the North American market. We also have a comprehensive network of distributors and representatives that covers all continents. Gasmet has certified its quality management system according to ISO 9001. The company’s CEMS has received TÜV (17th Implementing Order) and MCERTS certificates. In 2016 Gasmet launched a free app on both iOS and Android, providing anyone with an interest in gas monitoring with quick and easy access to an enormous volume of highly useful information. A Gasmet FTIR multiparameter emissions monitor at Thetford power station is being used to demonstrate that the plant is performing within the conditions of its environmental permit. The Gasmet™ continuous mercury monitoring (CMM) system can measure the lowest concentrations of total mercury in samples containing high amounts of dust and potentially interfering gases, in applications such as coal fired power plants stations and power plants co-incinerating waste. The Gasmet™ DX4000 is a portable heated FTIR gas analyser for monitoring multiple compounds simultaneously in stack gas and process monitoring applications. The Gasmet™ DX4040 is the only truly portable FTIR ambient gas analyzer in the world. It is ideal for applications such as chemical spill investigation, security, forensics, occupational health, anaesthetic gases, greenhouse gases, refrigerants, leak detection, VOCs, research etc. Gasmet showcases their CEMS II e system. Gasmet Technologies (Finland) has announced the publication of a free White Paper on the simultaneous measurement of multiple gases in a wide variety of applications using FTIR (Fourier Transform InfraRed) technology. Sharing a common goal, experts in emissions monitoring and emissions abatement have formed a working partnership to develop innovative new materials for treating pollutants in flue gas emissions. The Gasmet APP is now available free of charge on both iOS and Android Smartphones, providing anyone with an interest in gas monitoring with quick and easy access to an enormous volume of highly useful information. Gasmet Technologies, the manufacturer of FTIR gas analyzers, organised a meeting in Lisbon, immediately prior to the CEM 2016 conference and exhibition in May, to provide delegates with an insight into the wide variety of applications for which FTIR technology is employed. The Gasmet Technologies CEMS II e continuous emissions monitoring system has completed EN 15267-3 testing using FTIR technology for the analysis of low-range HF, low-range NO, CH4 and formaldehyde. Gasmet will be at this year's CEM, held in Lisbon, Portugal from 18 to 20 May.